Now the world at large thinks Samantha has developed a rare skin disease, a disease which forces her to quit her day job and stay out of the light of the sun. Now working the night shift as a private investigator, Samantha is hired by Kingsley Fulcrum to investigate the murder attempt on his life, a horrific scene captured on TV and seen around the country. But as the case unfolds, Samantha discovers Kingsley isn't exactly what he appears to be; after all, there is a reason why he survived five shots to the head. I really liked this book (and the whole series). I liked that it showed another side, a less glitzy side to becoming a vampire. 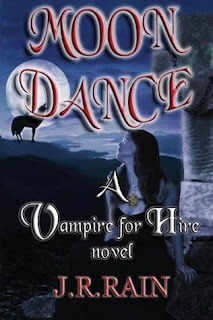 Most books glamorize vampires but I thought that it was refreshing to see the other side. It was interesting to see what kind of problems becoming a vamp would cause in the life of the average person. Samantha is a mother, wife & private investigator trying to do the best that she can with the hand she has been dealt. After being attacked six years ago, she is still struggling with the fact that she is a vampire and how she should deal with it. Although she seems to have a handle on it most of the time, the people surrounding her aren't really the most supportive, mainly her husband. I think Sam was a really likable character. She seemed so real & honest. Her dry humor and snark really made the book what it was. The mystery aspect of the story was great and I didn't suspect the culprit throughout most of the book. I love a good mystery though, and this book delivered. I think the only thing that I didn't really like in this book was that there should have been more interaction between Sam and Kingsley. That part of the story seemed a little rushed and disjointed, to me anyway. It was a really good book though, and even the parts that I didn't like still wouldn't keep me from recommending this book. It was a thoroughly enjoyable book!